In the first week, another seven folk joined in and sent their predictions either via Twitter or Facebook, and from there it has continue to grow, with the Week 2 Predictor very quickly becoming the highest viewed article in WeegieRugby history. 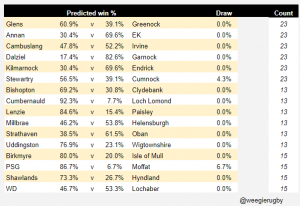 So for Week 3 it’s evolved again, with a GoogleSheet summarising the predictions. Here’s what the Friday night summary looked like. We’re now up to 28 entries, all via Facebook or Twitter, so to simplify things next week might need to be via a GoogleForm. Previous Previous post: Is Womens Rugby in Scotland Starting to Encounter Similar Issues to the Mens Game?